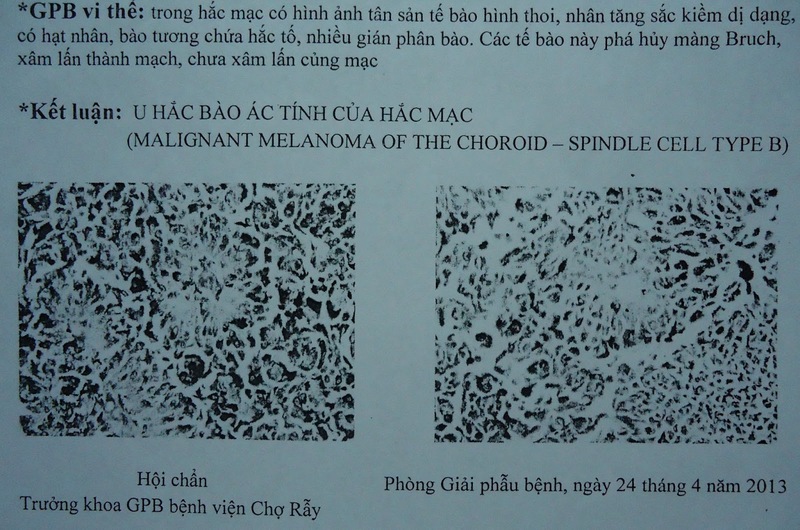 Man 53 yo, Binh duong province, loss of right vision for 3 months, ultrasound and OCT of Eye Hospital think about melanoma of ciliary body. At Medic Center, ultrasound detects a right intraocular tumor, size of 12x10mm, at anterior and internal location, echo rich, round border, no calcification, vegetation and nor posterior shadowing. It is a hypovascular tumor. There is a right retinal detachment. On elastographic ultrasound with eSie Touch and ARFI techniques ( Acuson S2000, Siemens) velocity of VTI is hard in moderate grade, homogenous, in grey color meanwhile tumor is hard and homogenous in eSie Touch ( black and blue). MRI reveals an intraocular tumor on right eye, which is from ciliary body, size of 12x11mm, low signal on T2W1, and high signal on T1W1 and T1GRE, lightly catched Gado, and no extraocular invasion. Follow-up a Choroidal-Ciliary Melanoma. 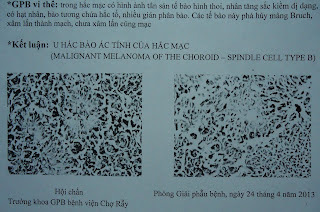 Surgery was done on 15-4-2013, microscopic result :malignant melanoma of the choroid.